This level have normal difficulty and you need to use good strategy to break all jellies. 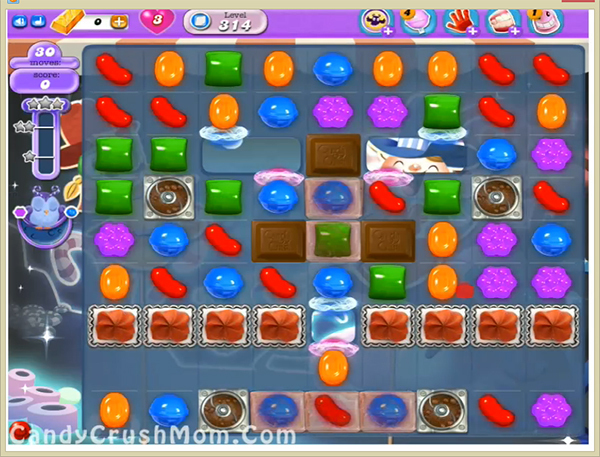 For this level you should try to play from bottom and break blockers plus use striped candies to break chocolates. After 20 moves you will have moon struck then try to use special combos like colorbomb with striped candy to break more jellies. You could use lollipop booster to break remaning jellies but try to use above strategy to complete this level without booster. We completed this level with 99900 score using above strategy and got three star score plus completed before four moves.